As the use of cell phones expands, so do the number of options becoming available. From web browsing to email, more people are going online on their phones. However, most sites are not optimized for hand helddevices such as cell phones. There are really two things to consider; your site design and how your user is going to find your site through mobile search. The first thing to consider is how to design for the mobile platform. No, you don’t need a separate site, you just need a cascading style sheet (CSS) attached to your website that feeds up specific instructions to a mobile browser. For the most part, mobile browsers are a lot like the web used to be; mainly text and links. Granted, as Blackberries, the iPhone and other more advanced devices come along, the abilities also advance. The iPhone views the web as it should be without anything stripped out. But, since that’s just arriving on the scene, we should really focus on the what the mass mobile market has, bare bones handheld web browsers. You have very limited screen real estate. About 2×3 inches or so. All fonts should be in their most basic format. Forget about color and typography. All images should be striped out, unless they are absolutely necessary. Remove all advertising as you already have limited screen space. If you don’t need it, hide it. Remove any MyBlogLog, Twitter or other second hand services. Focus on your content. Remove all background colors. Basic black text on a white background is good. Create basic forms, if you choose to keep them. My advice would be to remove them and just showcase the phone number. They are on their cell phone after all. Remove Flash, Java and any plug-in content unless absolutely necessary. 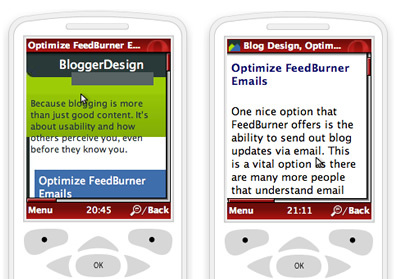 If you want to view your site as if you were on a mobile browser, I have found a few choices. The first is the Web Developer extension for Firefox. It allows you to overwrite the web style sheet with the handheld one if a site has one. If not, it’ll just show the site without any CSS styles. I also came across an iPhone simulator called iPhoney. It looks cool, but since the iPhone really doesn’t render a striped down version of a site, it’s more just eye candy. The best option I came across was the Opera Mini browser. They have an online version and it’s free. Simply put in a URL and it’ll render a website as if it was on a mobile phone. From my testing, the Opera Mini browser was a great experience. It’s got a small screen, shows handheld versions of style sheets and all in all, it does a great job at giving you what a real phone will show. Here is my before having a handheld CSS and after experiences on the Opera Mini browser. So where does SEO fall into all of this? Is there a separate ranking algorithm for mobile devices? No, not from what I can see. I did a few Yahoo oneSearch‘s with the Opera phone simulator and with Yahoo web search. The results vary a little, but for the most part, they are the same. The main difference is that the first page of results shows 3 results, not 10. So a higher ranking will more than likely draw more traffic. I also tried an Ask search and compared the web and mobile versions. They were exactly the same. Ask also showed 5 results on the mobile search results compared to Yahoo’s 2. Google however didn’t allow me access to Google Mobile so I couldn’t test that. For the most part, I see mobile search more focused on news, weather and local searches. Sure, sites like YouTube, MySpace and other social avenues, along with possibly some web applications like Google Docs or Zoho may be accessed often, generic web browsing is not where I see the mobile search market. People on their phones, and surfing the net, are probably looking for information on where they are going, or trying to access email and news. The best way to ensure you are found on mobile devices is to make sure your site is in all the local search directories with full and accurate profiles. Places like Google Local and Yahoo local probably receive more traffic from users who want to find business in a certain area. When I’ve used my phone to search the web, I was searching for a restaurant. This is where I see the bulk of mobile search traffic going. Mobile search is an area of the Internet that is heating up. Some are putting a lot of stock into phones as they become more widespread and come with more and cheaper wireless capabilities. However, site owners are not always taking those platforms into account. To ensure your site is mobile ready, get listed in local directories and add a handheld CSS file to your site. These two easy items are a great start for optimizing your site for handheld web browsers. VOTE for this TopRank Challenge article!